4 Types of Fencing: Which is Best for Your Property? The first step to choosing your new fence is deciding what material you prefer. 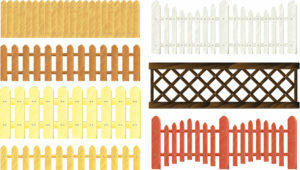 The first step to choosing your new fence is deciding what material you prefer. This is determined by many factors, including security, privacy, cost, maintenance, appearance, and many more. Here is some information about 4 of the most popular fencing choices. Wood fencing is the most popular type of fencing in America. It is extremely versatile and usually easy to repair. As long as it is properly maintained, a wood fence can last several years. The downside to wood fencing is that because it is made of a porous, natural material, it is vulnerable to damage from moisture, impact, and bad weather. Vinyl fencing is quite strong. Many homeowners prefer it because it lasts for years and it requires very little maintenance. Vinyl fencing comes in a wide variety of colors and styles and is easy to install. Unfortunately, it’s also one of the more expensive fencing choices. That said, it’s long life expectancy tends to offset the cost. When you care for it properly, your wrought iron fencing could last decades. They are incredibly strong and are a strong deterrent for would-be home invaders. One of the biggest downsides of a wrought iron fence, though, is the cost. They are incredibly expensive to install because of the heavy materials needed. The upkeep of a wrought iron fence can also be quite costly, as they are prone to rust and damage to the metal typically requires a professional welder. Chain link fences are very popular among homeowners and property owners who are looking to stay on a budget. Chain link fencing is pretty inexpensive, durable, and requires very little upkeep. However, they also don’t really offer much privacy. Many homeowners who would like to add some privacy to their chain link fence will plant hedges or other dense plant life along the fence. This entry was posted on Wednesday, January 24th, 2018 at 10:14 am. Both comments and pings are currently closed.